When Jamie Charles Latham (1968-1991) of Westminster West died in a tragic accident, his family and friends concluded that permanent access to the Pinnacle on the western boundary of Westminster (a traditional local hiking destination, although then in private hands) would make a most fitting memorial to this lover of the outdoors in general and that beautiful landmark in particular. So it was that Jamie's mother, Alison Latham, together with seven other local residents and good friends of either Alison or Jamie, began what was to become an arduous several-year mission to acquire the desired public access to it. Thus, the original group of eight was comprised of Robert Haas (a farmer), Alison Latham (an accountant), Sean Long (then a medical salesperson), Beverly Major (a kindergarten teacher), Michael McKernan (a musician and then an anthropology graduate student), Arthur Westing (an ecology professor), Carol Westing (a special education teacher), and Ellen Zimmerman (a special education paraprofessional). The group soon decided that in order to best achieve their aim of public access to the Pinnacle it would be necessary to establish a formal organization. So in 1992 they founded the WINDMILL HILL PINNACLE ASSOCIATION, with Beverly Major serving as its President, Alison Latham as its Secretary and Registered Agent, and Ellen Zimmerman as its Treasurer. The Association adopted a Charter and Bylaws in July 1992, became a Vermont non-profit corporation in 1993, and then both a federally and Vermont tax-exempt corporation in 1994 and 1995. This fledgling Association met at least monthly, struggling continuously for the ensuing several years to find such access. Every southerly and easterly abutting landowner to the Pinnacle (some quite hard to locate) was approached for permission to establish a trail for public access over their land, although without success. The stalemate was finally on its way to being broken when in September 1994, through the good will of Winifred Bissell, the Association obtained an option to purchase her 48 acres lying immediately to the north of the Pinnacle. Then in early 1995 a most welcome offer was made to the Association by the then owners of the Pinnacle, Jonas and Elizabeth Littman, to actually donate that peak with its surrounding 47 acres if access to the Pinnacle could, indeed, be found away from their house site. Thus in June 1995 Alison Latham, through an act of determination and daring, privately purchased 175 acres lying on the ridge somewhat to the north of the Pinnacle, although not contiguous with the Bissell parcel — with her hope that the Association would in time be able to acquire both what she had just bought and the intervening land. Then in January 1996, the Association made its own first purchase, that of Bissell's 48 acres. Thus it was that in August 1997 everything did finally fall into place to achieve the long-sought-for access to the Pinnacle. 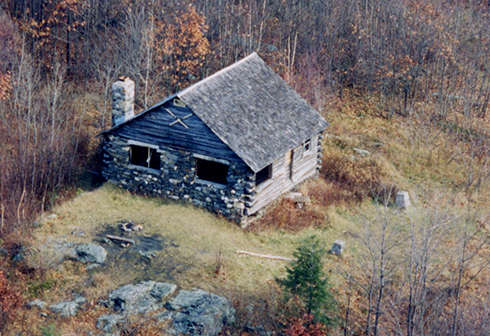 It was in that fateful month that the Association was able to augment its prior purchase of the 48-acre Bissell parcel by additionally purchasing Latham's 175 acres as well as 140 acres from the Littmans, which together closed the gap — and thereby having the Littmans graciously donate the Pinnacle with its cabin and surrounding 47 acres. And the rest is history! Finally it is important to mention that Judith Anderson (a land trust consultant who had grown up in Westminster West) joined the Association Board in 1996. And it was she who steered the Board in the direction of "thinking big," that is, for the group to not merely strive toward acquiring the Pinnacle itself, but rather to expand its vision to save in perpetuity as much of the Windmill Ridge as feasible, not only in order to make it accessible, but at the same time to protect for present and future generations the natural character of those lands, the wild plants and animals they support, and their aesthetic and inspirational values. And it was that visionary approach that was to make it possible to write successful grant proposals to private foundations and the Vermont Housing and Conservation Board for most of the funds needed for the sizable costs of acquisition, management, and insurance. 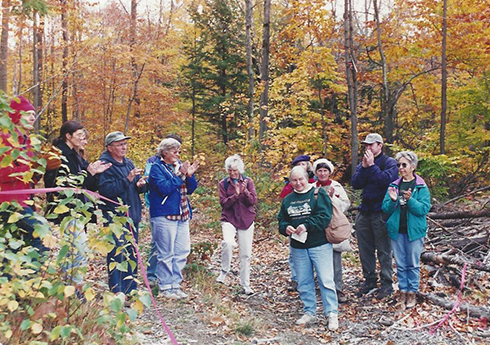 In 2007 the Pinnacle Association Board of Trustees engaged in a challenging opportunity to acquire 55 acres of vitally important land for conservation and public use. Known as Bald Hill and positioned adjacent to the property of the Bellows Falls Union High School (see Bald Hill under Trails & Maps for more information), the property is located beyond the Windmill Ridge. That location elicited an expansion of the Association’s mission to henceforth include “nearby areas”. In addition, a careful protocol and strategy were devised to empower local small groups to handle such an acquisition, so as to avoid spreading the energy and capacity of the central Board of Trustees too thinly. That area expansion was a leap for the organization, in terms of both structure and vision. Based upon the new model of local group empowerment, an additional opportunity was successfully pursued by a small committee of Pinnacle Board members and area residents to acquire over 200 acres in the area known as the Athens Dome. That land is located along the Athens/Grafton town line, and it adds to several other large properties that are protected from development. It includes features, such as a tumbling brook and an historic soapstone quarry, that required broadening of Pinnacle’s Management Plan. The project allowed for a linked expansion of the Windmill Ridge trail system over four miles farther towards the west. New trails, a shelter for overnight visits, and increased cooperative programming with local organizations are being developed in the Athens Dome area (see Athens Dome under Trails & Maps for more information). Both the Bald Hill and Athens Dome projects have newly attracted significant communities from the area, such as the Village of Bellows Falls and the Town of Grafton. The model of empowering smaller local groups seems to be successful. As a result of these efforts, the public benefits from the considerably wider diversity of special sites available for education and recreation. There has been a single gap in the trail system of the Windmill Ridge that has eluded considerable efforts to close. In 2012 trail licenses were acquired to enable hikers to walk through this gap area, linking the north and south sections of the Windmill Ridge trails. The new trail sections are being developed in 2013-14 so there will be a continuous trail stretch for hikers and runners who seek the long-distance challenge, from Grafton to Putney. For over twenty years the accumulated investment of funds, time, and human energy has built these reserves of land and trails, conserved and protected in perpetuity. The large scale of these protected natural habitats in unbroken stretches of forest is essential to maintain healthy ecosystems. 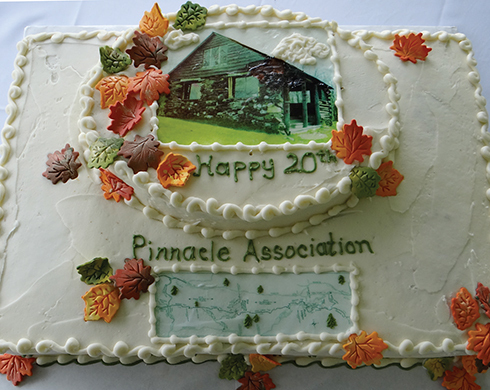 With interest, commitment, and support from those who value the beauty and importance of our natural resources, the Pinnacle Association will continue to provide cherished places for the public to visit and appreciate.